"The Tiger Leaves the Mountain"
Our esoteric astrologer and Chinese Astrology expert Malvin Artley looks at the meanings of the Chinese Year of the Tiger in 2010. Tiger years are traditionally ones of great change and innovation, and we will see some of that this year. The Chinese New Lunar Year begins on February 14, 2010, in association with the New Moon Eclipse in Aquarius, but the effects for all of us cover the whole of the twelve months ahead. This is a bad day for constructions, weddings or starting a family. This is a day for staying indoors and being domestic. In ignorance the young one cracks their skull against a greater foe. A stiffening breeze wafted up from the Indian valleys into the Nepali foothills in the shadow of the Himalayas. The winds carried portents as well as moisture, the countless thoughts of beings and prayers of gods and spirits in the subcontinent, and for the creatures of the forests who were busy with their dreams, the breeze brought them visions of things to be come, solutions to problems and welcome relief from the heat of the summer's oppression. As the moist currents of air rose skyward along the spines of the rising ridges the moisture formed fog and mists which pervaded the verdure of the Inner Terai, adding to the mystical quality of the day. Still a bit higher, and the mists began to condense on the leaves of the plants, causing sporadic droplets of rain to fall on the inhabitants of the forest floor below. As the gentle rain began to fall, a few drops hit the nose of the slumbering White Tiger, rousing him from his sojourn in the astral worlds where he had been in the company of one of the local resident spirit lords of the sacred places there. Cats are the messengers of the astral worlds, you know, and they report on the affairs of the world to the gods. The White Tiger was a majestic Royal Bengal, in the prime of his life, revered in local legend and worshipped by the people in the villages of the high forests. They would often leave ritual offerings for him and the odd sacrifice or two. Because of their kindness to him in the past he had stayed within a close distance to the villages but was always careful at the same time to keep his distance. The relationship with the villagers had been a good one over the years but had been somewhat troubled of late, though, because strangers had appeared on the trade routes through the villages and the villagers had been hearing stories from the strangers about the virility tigers could bring when placed in medicinal preparations. A white tiger such as he, they said, would fetch a handsome price for the efforts of the man who could catch him. 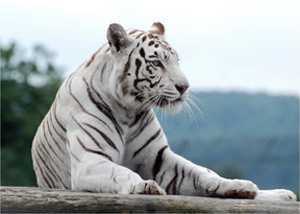 White tigers are rare and were said to have special properties above and beyond those of the average tiger. In his astral sojourn that day he had asked the local spirit lord about the strangers and why they were so interested in him. It would seem that the local legends about the White Tiger had spread beyond his hills into lands farther afield. The spirit lord took a particular interest in the White Tiger that day, for the spirit lord could see into the future and he saw the fate that awaited not just the White Tiger, but all the tigers of the area. He thought the White Tiger could perform a great service to all in the area - one that would have benefits far into the future, so he engaged him and began to regale him with tales of the foreigners and tigers in faraway lands. “Rightly so!” interjected the White Tiger, interrupting the spirit lord, which tigers are known to do. The spirit lord smiled benignly at the White Tiger, bemused by his lack of decorum. “Yes, my friend - rightly so!” said the spirit lord, suddenly erupting into laughter. The White Tiger was taken aback by this unexpected turn by a normally composed spirit lord and decided to take a more composed stance, not knowing what this being would do next. A shiver went through the White Tiger and he grew very anxious and quiet, realizing suddenly why people had been trying to draw him closer into the villages. He knew his relationship to the villagers would be very different from then on. The White Tiger was deeply saddened by this news, but he knew within himself that the spirit lord had spoken true and was correct. On several recent occasions some of the villagers had gone out with nets and spears and had almost cornered him, but he knew the forest too well and always managed to elude them. They would leave sacrifices close to the villages in open spaces in an effort to draw him out, but the other animals always warned him, for which he was secretly grateful. He knew the people would try to stop him leaving, though, and the spirit lord read his thoughts on that matter very clearly. 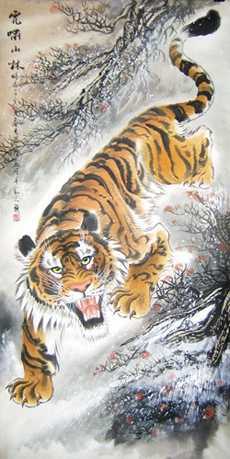 As the gentle forest rain began to fall more heavily on the White Tiger he awoke fully from his reverie. In the distance he could hear the barking of dogs and the hairs went up on his back. He knew the spirit lord had spoken in truth. He growled his displeasure at having to leave his beloved domain, but he knew full well what awaited him should he stay. Thankful for the information, but heavy at heart, he arose and sniffed the air, seeking to find his direction and a safe passage out. A lone magpie song gave him the omen he sought, and bidding his goodbye to his brothers and the good people of the villages he set out on his journey to a strange land. What would await him? Who would he meet? Would his life be hard? Still, he knew he was up to the task. He would be the finest example of a tiger there ever was, and with conviction as his guiding star, he set off down the mountain through the mists. In part two of this article, Malvin examines the Chinese Year of the Tiger in 2010. 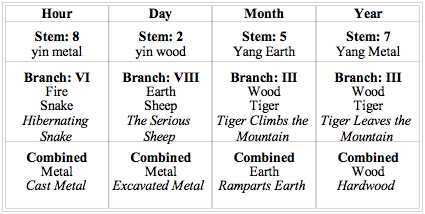 Malvin explains the astrological energies and outlines the nature of the Tiger in Chinese Astrology, drawing out the examples of Tiger years in the past, showing how they apply to this one.